Exeter, NH, though I also lived in Cape Town, South Africa for 7 years. 2. How did you hear about ATC? Board member Dan Schrager initially introduced me to the organization. 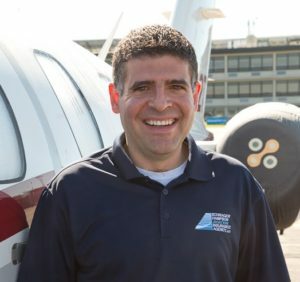 Also, both ATC and Gary Oberstein are clients of my aviation insurance agency so I also learned a lot about the organization by working on the ATC insurance program with Gary and Martha. 3. As a new member of the Board of Directors, what will be your role? I will be working closely with fellow board members to sustain the momentum and success ATC has experienced, while looking for opportunities for the organization to grow. 4. What are you most excited about now that you are apart of the Board of Directors? I’m excited to now have the opportunity to be involved in the strategical, business, and operational aspects of ATC. 5. Since you are also a pilot, where is your favorite place to fly? Teterboro, NJ. I’m generally not a big city guy, but I love the view of New York out the window on approach and departure. 6. What do you love about flying? The feelings of freedom, excitement, tranquility, and sense of adventure I get at various phases of flight. 7. What is something most people don’t know about you? I owned and operated a franchise seafood restaurant when I was living in South Africa. I always say that was my business school education—it was a profitable business and great learning experience but not an industry I would want to go into again. 8. How long have you been a pilot? 9. Do you do Dream Flights? Discovery Flights? Cadet Flights? I have been flying for ATC since spring of 2016, and have done both Dream Flights and Discovery Flights. Over the past year, I was paired with an amazing young woman in the Discovery Flyer Program, and it was so rewarding to see her progress to the Cadet Program. 10. What made you want to become a pilot? I’ve loved everything about airplanes for as long as I can remember. We would fly to Florida to visit family several times per year when I was a very young child and I was always glued to the window on takeoff and landing. 11. How do you think ATC is changing lives? ATC exposes children to aviation who otherwise may never have been, but it is much more than that. Particularly in the Discovery Flyers Program, ATC shows kids that there is a bigger world out there full of opportunity, and helps instill in them the confidence to take action to make their dreams a reality. 12. Is there something I haven’t asked you that you would like to say about ATC? Yes, we always talk about how much the kids get out of ATC but as a volunteer pilot or member of the ATC support team, you will get so much out of the experience as well. Sometimes, I think ATC may be enriching my life as much or more than it does for the kids.